In this Photoshop Effects tutorial, we're going to learn how to use a photo as a layer mask, essentially using the image to mask itself, something that Photoshop doesn't normally allow us to do. We'll be using it to give the image a nice soft glow effect, but if you experiment on your own, you'll find lots of creative ways to use this technique. Press "Ctrl+J" (Win) / "Command+J" (Mac) to duplicate the Background layer. Hold down "Ctrl" (Win) / "Command" (Mac) while clicking the "New Layer" icon. The new blank layer appears between the two other layers. Press "Ctrl+Backspace" (Win) / "Command+Delete" (Mac) to fill the new layer with white. Press "Ctrl+A" (Win) / "Command+A" (Mac) to select the image on "Layer 1", then press "Ctrl+C" (Win) / "Command+C" (Mac) to copy it to the clipboard. Click the "Add Layer Mask" icon at the bottom of the Layers palette to add a mask to "Layer 1". Hold down "Alt" (Win) / "Option" (Mac) and click on the layer mask's thumbnail to select it. Press "Ctrl+V" (Win) / "Command+V (Mac) to paste the image into the layer mask. The image now appears in the layer mask's thumbnail in the Layers palette. Press Ctrl+D (Win) / Command+D (Mac) to deselect the image at this point. 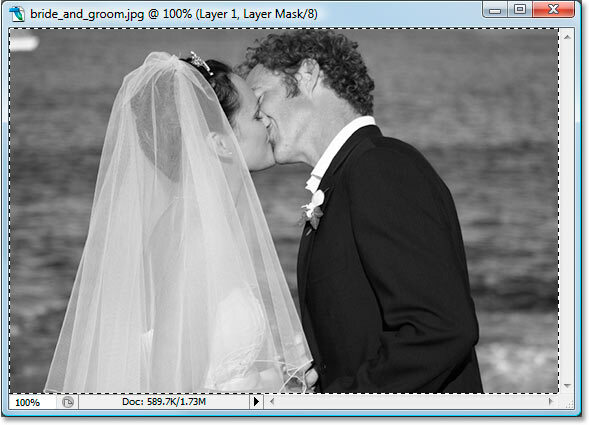 Click on Layer 1's thumbnail in the Layers palette to display the image in the Document Window once again. Press "Ctrl+I" (Windows" / "Command+I" (Mac) to invert the layer mask and improve the look of the image. Go to Filter > Blur > Gaussian Blur to bring up the Gaussian Blur dialog box. Drag the slider bar at the bottom of the dialog box left and right to increase or decrease the Radius value. The higher the Radius value, the more blur that's applied, which creates the glow effect. You can see a preview of the glow effect in the Document Window as you're dragging the slider. Drag the slider until you're happy with the effect. I'm using a low resolution image for this tutorial, so for me, a Radius value of about 6 pixels gives me a nice glow. If you're using a high resolution image, you'll probably want to use a value of 8 or higher. 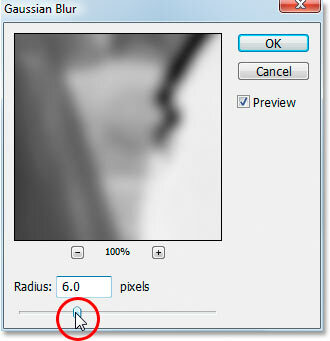 Click OK when you're done to exit out of the Gaussian Blur dialog box. The image after applying the Gaussian Blur filter. Press "Ctrl+E" (Win) / "Command+E" (Mac) to merge the top two layers in the Layers palette into one. Press "Ctrl+J" (Win) / "Command+J" (Mac) to duplicate the merged layer. Change the blend mode of the new layer from "Normal" to "Multiply". Lower the opacity of the layer if the image now appears too dark. The image now appears darker with better contrast and slightly improved color. Click the "New Adjustment Layer" icon at the bottom of the Layers palette. 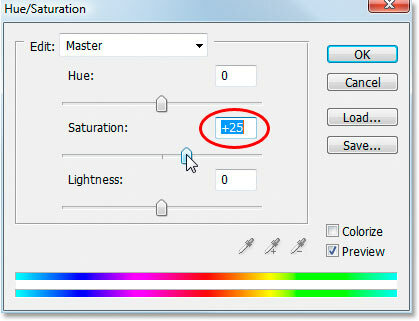 Drag the "Saturation" slider in the middle of the "Hue/Saturation" dialog box to the right to boost the colors in the image. And there we have it! This is just one example of what you can do by using an image as its own layer mask. Experiment on your own by applying different filters to the mask or to the image itself, using different colors or other images for the background, flipping the mask vertically or horizontally, whatever you can think of. You're bound to find lots of creative uses for it. Visit our Photo Effects section for more Photoshop effects tutorials!